Big Beauty Giveaway Must Be 18 Years Of Age At The Time Of Entry And United State Resident.and Submit Your Entry And Get Chance To Win A Set Of Beauty Items Valued At $200, The Giveaway Ends May 13, 2018, And Fill Your Name And Your Email Address And Your Website,and Like And Follow Our Instagram Page. 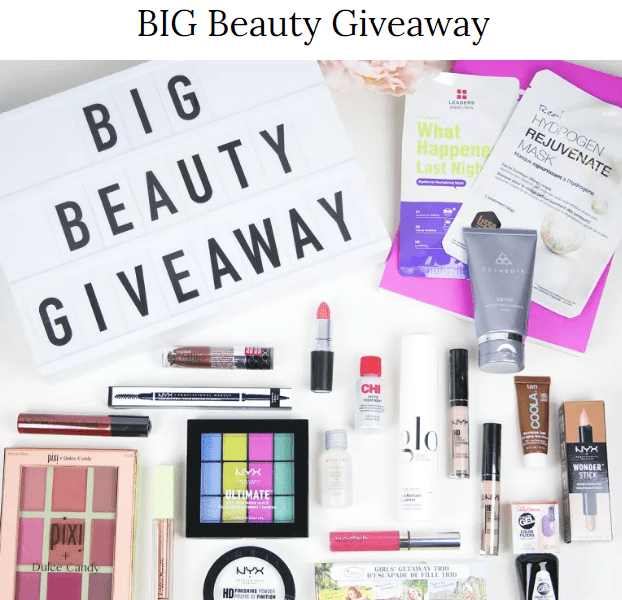 Big Beauty Giveaway – Enter For Your Chance To Win A Set Of Beauty Items Valued At $200! Eligibility: Must Be 18 Years Of Age At The Time Of Entry And United State Resident. Prize (s): One winner will be awarded a beauty set featuring items from Pixi Beauty, NYX Cosmetics, MAC Cosmetics, The Balm, Coola, Cosmedix and more.